Giordano Bruno (Italian: [dʒorˈdano ˈbruno]; Latin: Iordanus Brunus Nolanus; 1548 – 17 February 1600), born Filippo Bruno, was an Italian Dominican friar, philosopher, mathematician, poet, and astrologer. He is remembered for his cosmological theories, which conceptually extended the then novel Copernican model. He proposed that the stars were just distant suns surrounded by their own exoplanets and raised the possibility that these planets could even foster life of their own (a philosophical position known as cosmic pluralism). He also insisted that the universe is in fact infinite and could have no celestial body at its "center". In addition to cosmology, Bruno also wrote extensively on the art of memory, a loosely organized group of mnemonic techniques and principles. Historian Frances Yates argues that Bruno was deeply influenced by Arab astrology (particularly the philosophy of Averroes), Neoplatonism, Renaissance Hermeticism, and legends surrounding the Egyptian god Thoth. Other studies of Bruno have focused on his qualitative approach to mathematics and his application of the spatial concepts of geometry to language. The records of Bruno's imprisonment by the Venetian inquisition in May 1592 describe him as a man "of average height, with a hazel-coloured beard and the appearance of being about forty years of age". Alternately, a passage in a work by George Abbot indicates that Bruno was of diminutive stature: "When that Italian Didapper, who intituled himselfe Philotheus Iordanus Brunus Nolanus, magis elaborata Theologia Doctor, &c with a name longer than his body...". The word "didapper" used by Abbot is the derisive term which at the time meant "a small diving waterfowl". Theophilus - [...] air through which the clouds and winds move are parts of the Earth, [...] to mean under the name of Earth the whole machinery and the entire animated part, which consists of dissimilar parts; so that the rivers, the rocks, the seas, the whole vaporous and turbulent air, which is enclosed within the highest mountains, should belong to the Earth as its members, just as the air [does] in the lungs and in other cavities of animals by which they breathe, widen their arteries, and other similar effects necessary for life are performed. The clouds, too, move through accidents in the body of the earth and are in its bowels as are the waters. [...] With the Earth move [...] all things that are on the Earth. If, therefore, from a point outside the Earth something were thrown upon the Earth, it would lose, because of the latter's motion, its straightness as would be seen on the ship [...] moving along a river, if someone on point C of the riverbank were to throw a stone along a straight line, and would see the stone miss its target by the amount of the velocity of the ship's motion. But if someone were placed high on the mast of that ship, move as it may however fast, he would not miss his target at all, so that the stone or some other heavy thing thrown downward would not come along a straight line from the point E which is at the top of the mast, or cage, to the point D which is at the bottom of the mast, or at some point in the bowels and body of the ship. Thus, if from the point D to the point E someone who is inside the ship would throw a stone straight up, it would return to the bottom along the same line however far the ship moved, provided it was not subject to any pitch and roll." The Vatican has published few official statements about Bruno's trial and execution. In 1942, Cardinal Giovanni Mercati, who discovered a number of lost documents relating to Bruno's trial, stated that the Church was perfectly justified in condemning him. On the 400th anniversary of Bruno's death, in 2000, Cardinal Angelo Sodano declared Bruno's death to be a "sad episode" but, despite his regret, he defended Bruno's prosecutors, maintaining that the Inquisitors "had the desire to serve freedom and promote the common good and did everything possible to save his life." In the same year, Pope John Paul II made a general apology for "the use of violence that some have committed in the service of truth". Bruno Giordano features as the hero in a series of historical crime novels by S.J. Parris (a pseudonym of Stephanie Merritt). In order these are Heresy, Prophecy, Sacrilege, Treachery and Conspiracy. Bertold Brecht wrote one of his "Calendar Stories" (Kalendergeschichten) on Bruno Giordano. In The heretic's coat (Der Mantel des Ketzers), Brecht extols Bruno's unwavering honesty and selfless concern for justice. Bruno plays a small but significant role in Martin Seay's 2016 novel The Mirror Thief. The Giordano Bruno Foundation (German: Giordano Bruno Stiftung) is a non-profit foundation based in Germany that pursues the "Support of Evolutionary Humanism". It was founded by entrepreneur Herbert Steffen in 2004. The Giordano Bruno Foundation is considered critical of religion, which it characterizes as detrimental to cultural evolution. Broadcasting station 2GB in Sydney, Australia is named for Bruno. The two letters "GB" in the call sign were chosen to honour Bruno who was much admired by Theosophists. ↑ Bruno was a mathematician and philosopher, but is not considered an astronomer by the modern astronomical community, as there is no record of him carrying out physical observations, as was the case with Brahe, Kepler, and Galileo. Pogge, Richard W. http://www.astronomy.ohio-state.edu/~pogge/Essays/Bruno.html 1999. ↑ Shackelford, Joel (2009). "Myth 7 That Giordano Bruno was the first martyr of modern science". In Numbers, Ronald L. Galileo goes to jail and other myths about science and religion. Cambridge, Mass: Havard University Press. p. 66. "Yet the fact remains that cosmological matters, notably the plurality of worlds, were an identifiable concern all along and appear in the summary document: Bruno was repeatedly questioned on these matters, and he apparently refused to recant them at the end.14 So, Bruno probably was burned alive for resolutely maintaining a series of heresies, among which his teaching of the plurality of worlds was prominent but by no means singular." ↑ Gatti, Hilary (2002). Giordano Bruno and Renaissance Science: Broken Lives and Organizational Power. Ithaca, New York: Cornell University Press. pp. 18–19. Retrieved 21 March 2014. For Bruno was claiming for the philosopher a principle of free thought and inquiry which implied an entirely new concept of authority: that of the individual intellect in its serious and continuing pursuit of an autonomous inquiry… It is impossible to understand the issue involved and to evaluate justly the stand made by Bruno with his life without appreciating the question of free thought and liberty of expression. His insistence on placing this issue at the center of both his work and of his defense is why Bruno remains so much a figure of the modern world. If there is, as many have argued, an intrinsic link between science and liberty of inquiry, then Bruno was among those who guaranteed the future of the newly emerging sciences, as well as claiming in wider terms a general principle of free thought and expression. 1 2 "Giordano Bruno". Encyclopedia Britannica. ↑ Weiner, Andrew D. (1980). "Expelling the Beast: Bruno's Adventures in England". Modern Philology. 78 (1): 1–13. doi:10.1086/391002. JSTOR 437245. ↑ Bossy, John (1991). Giordano Bruno and the Embassy Affair. New Haven: Yale University Press. ISBN 0-300-04993-5. ↑ "Giordano Bruno". Encyclopedia Britannica. Retrieved 8 May 2014. At the time such a move did not seem to be too much of a risk: Venice was by far the most liberal of the Italian states; the European tension had been temporarily eased after the death of the intransigent pope Sixtus V in 1590; the Protestant Henry of Bourbon was now on the throne of France, and a religious pacification seemed to be imminent. ↑ Blackwell, Richard (1991). Galileo, Bellarmine, and the Bible. Notre Dame: University of Notre Dame Press. p. 25. ISBN 0268010242. ↑ Giordano Bruno, Teofilo, in La Cena de le Ceneri, "Third Dialogue," (1584), ed. and trans. by S.L. Jaki (1975). 1 2 Bruno, Giordano. "Third Dialogue". On the infinite universe and worlds. ↑ Soter, Steven (March 13, 2014). "The cosmos of Giordano Bruno". Discover. Retrieved July 14, 2015. ↑ "Giordano Bruno: On the Infinite Universe and Worlds (De l'Infinito Universo et Mondi) Introductory Epistle: Argument of the Third Dialogue". Retrieved 4 October 2014. ↑ Hetherington, Norriss S., ed. (April 2014) . Encyclopedia of Cosmology (Routledge Revivals): Historical, Philosophical, and Scientific Foundations of Modern Cosmology. Routledge. p. 419. ISBN 9781317677666. Retrieved 29 March 2015. Bruno (from the mouth of his character Philotheo) in his De l'infinito universo et mondi (1584) claims that "innumerable celestial bodies, stars, globes, suns and earths may be sensibly perceived therein by us and an infinite number of them may be inferred by our own reason." ↑ Seife, Charles (1 March 2000). "Vatican Regrets Burning Cosmologist". Science Now. Retrieved 24 June 2012. 1 2 White, Michael. The Pope and the Heretic: The True Story of Giordano Bruno, the Man who Dared to Defy the Roman Inquisition, p. 7. Perennial, New York, 2002. ↑ Herbermann, Charles, ed. (1913). "Giordano Bruno". Catholic Encyclopedia. New York: Robert Appleton Company. 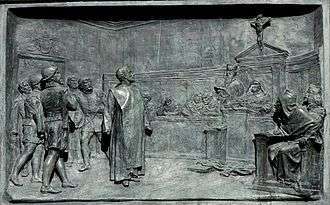 ↑ "Summary of the trial against Giordano Bruno: Rome, 1597". Vatican Secret Archives. Archived from the original on 9 June 2010. Retrieved 18 September 2010. ↑ Bhattacharjee, Yudhiijit (13 March 2008). "Think About It". Science. 319: 1467. doi:10.1126/science.319.5869.1467b. ↑ Dr. Michael Schmidt-Salomon (26 February 2008). "giordano bruno denkmal". ↑ Powell, Corey S. (10 March 2014). "Did Cosmos Pick the Wrong Hero?". Discover. Kalmbach Publishing. Retrieved 16 March 2014. ↑ Rosenau, Josh. "Why Did Cosmos Focus on Giordano Bruno?". National Center for Science Education. Retrieved 14 April 2014. ↑ Sessions, David (3 March 2014). "How 'Cosmos' Bungles the History of Religion and Science". The Daily Beast. Retrieved 8 May 2014. ↑ Swinburne, Algernon Charles. 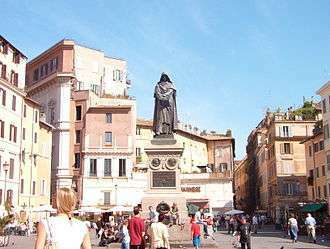 "The Monument of Giordano Bruno". Retrieved July 13, 2015. ↑ "Tom Hunley's "Epiphanic Structure in Heather McHugh's Ars Poetica, 'What He Thought'" - Voltage Poetry". Voltage Poetry. ↑ Kohn, Rachael (15 November 2006). "Theosophy Today". The Spirit of Things (Transcript) "Erica Patient: She came into contact with theosophy through 2GB, Station 2GB when it was owned by the Theosophical Society. Rachael Kohn: GB stands for Giordano Bruno. Erica Patient: It does. Actually we wanted to have AB for Annie Besant, but it sounded too like ABC. So they said they wouldn't have it.". Australian Broadcasting Corporation. Retrieved 12 January 2009. ↑ "A PERSPECTIVE ON BRUNO'S "DE COMPENDIOSA ARCHITECTURA ET COMPLEMENTO ARTIS LULLII"". JSTOR 24336760. ↑ "Thirty dangerous seals - Lines of thought". ↑ "'Meanings of "contractio" in Giordano Bruno's Sigillus sigillorum' - Staff". 1 2 "All About Heaven - Sources returnpage". ↑ "Anima Mundi: The Rise of the World Soul Theory in Modern German Philosophy". ↑ "Progress and the Hunter's Lamp of Logical Methods". galileo. ↑ "Full text of "THE PLEASURE OF THE DISPUTE"". 1 2 "Eros and Magic in the Renaissance". ↑ "De monade, numero et figura liber". Encyclopedia Britannica. Blackwell, Richard J.; de Lucca, Robert (1998). Cause, Principle and Unity: And Essays on Magic by Giordano Bruno. Cambridge University Press. ISBN 0-521-59658-0. Blum, Paul Richard (1999). 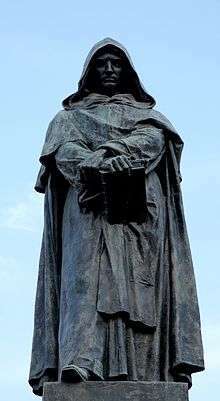 Giordano Bruno. Munich: Beck Verlag. ISBN 3-406-41951-8. Culianu, Ioan P. (1987). Eros and Magic in the Renaissance. University of Chicago Press. ISBN 0-226-12315-4. Gatti, Hilary (2002). Giordano Bruno and Renaissance Science. Cornell University Press. ISBN 0-8014-8785-4. McIntyre, J. Lewis (1997). Giordano Bruno. Kessinger Publishing. ISBN 1-56459-141-7. Mendoza, Ramon G. (1995). The Acentric Labyrinth. Giordano Bruno's Prelude to Contemporary Cosmology. Element Books Ltd. ISBN 1-85230-640-8. Rowland, Ingrid D. (2008). Giordano Bruno: Philosopher/Heretic. Farrar, Straus, and Giroux. ISBN 0-8090-9524-6. Saiber, Arielle (2005). Giordano Bruno and the Geometry of Language. Ashgate. ISBN 0-7546-3321-7. Singer, Dorothea (1950). Giordano Bruno: His Life and Thought, With Annotated Translation of His Work – On the Infinite Universe and Worlds. Schuman. ISBN 1-117-31419-7. White, Michael (2002). The Pope & the Heretic. New York: William Morrow. ISBN 0-06-018626-7.